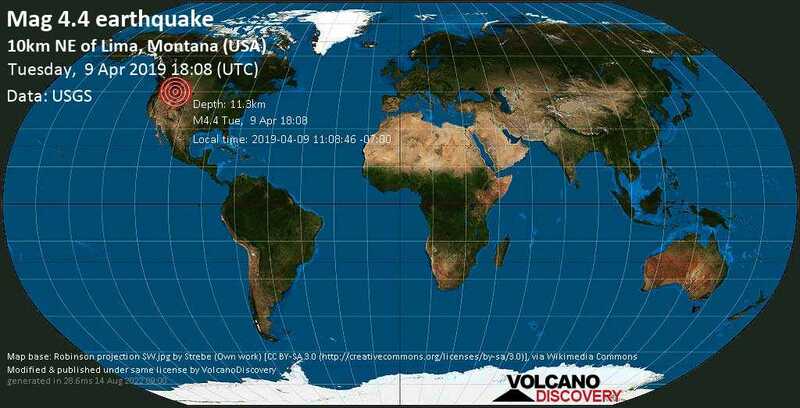 Apr 9 18:46: Magnitude recalculated from 5.0 to 4.4. Hypocenter depth recalculated from 10.3 to 10.1 km. Hypocenter depth recalculated from 10.1 to 11.3 km. Nampa, Id / MMI II (Very weak shaking): I was sitting on my sofa working and could feel a VERY light tremor that lasted about 30 seconds. (81.7 km E from epicenter) [Map] / MMI IV (Light shaking): It felt like a strong gust of wind rocked my RV for about 4 seconds. The second shaking a couple of minutes later lasted a couple of seconds and not quite as strong. Hamilton, MT (202.7 km NW from epicenter) [Map] / MMI II (Very weak shaking): Our office building creaked and the door rattled. Moore, Idaho (127.3 km SSW from epicenter) [Map] / MMI IV (Light shaking): I was laying awake in my bed and I felt a light shaking, up and down not so much side to side. I got up to check the time, on our stove it said 12:08 the stove is 2 minutes slow from the time on the phone. My wife who was sitting on the couch said "Did you get up because you felt something?" I said "ya I think it was an earth quake."